One of the things I love about doing an interactive blog where I go out and meet people is finding out about interesting places I probably never would’ve known about if I wasn’t doing this blog. 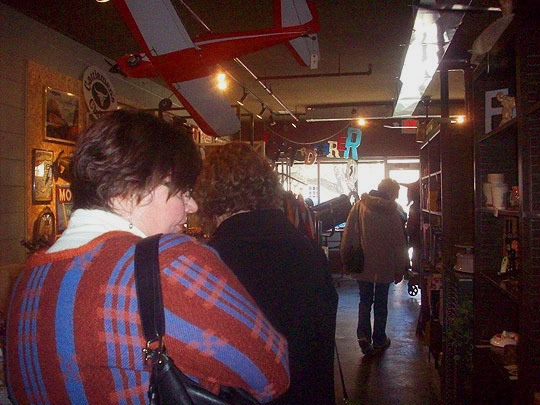 When I did the post on the Costume Trunk on Main Street, owner Steve Spain told me of several unique shops nearby his that sounded really cool. 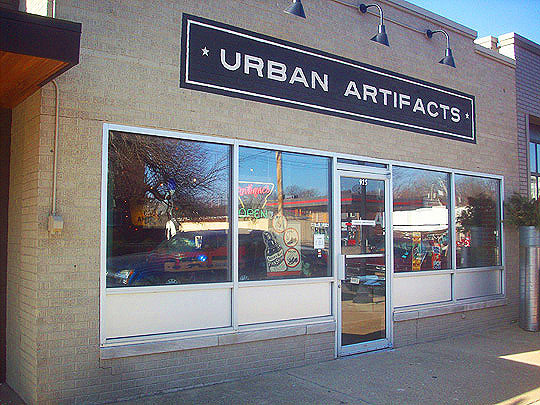 The first one I thought we’d check out is a place called, Urban Artifacts, which is just around the corner from The Costume Trunk. And so, to the MBIP mobile we go! And here we is, let's see what's going on at Urban Artifacts. "Shake, apply, polish." A not-so distant cousin to, "lather, rinse repeat." Wow! This photo doesn't do justice to the sensory overload that you're hit with when you walk into this shop. There's tons of cool stuff in here. 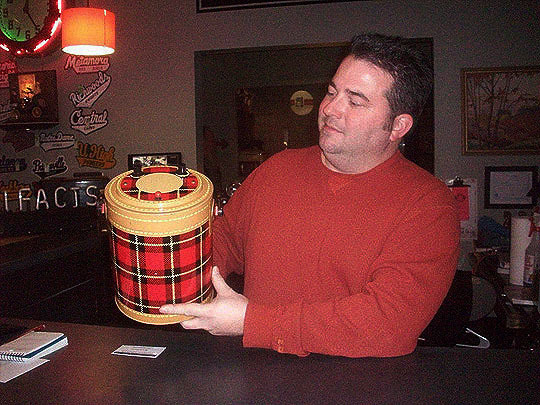 Here's the owner of Urban Artifacts, Jon Walker holding a vintage tube radio. Jon opened the shop six months ago and said he's gotten a good reaction from people so far. 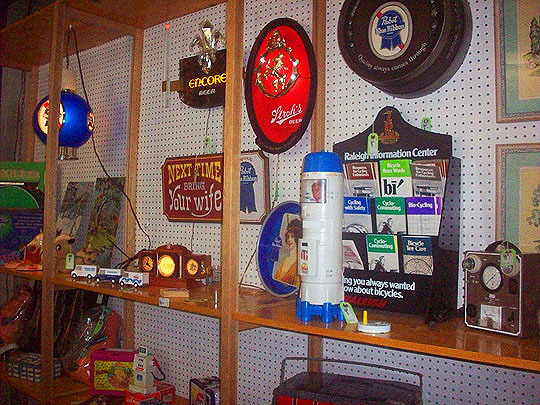 He told me most of the items for sale are collected artifacts that he and his wife find on road trips. 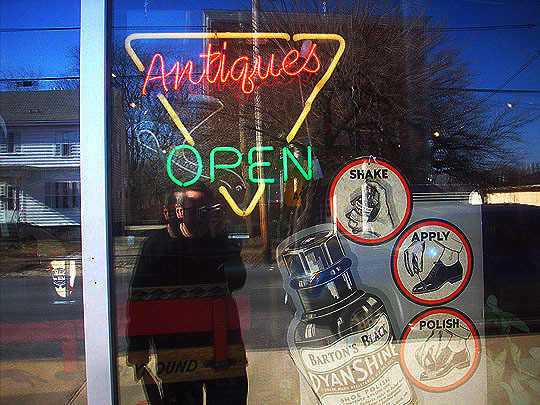 Jon lit up this cool neon sign he had recently acquired which sits at the back counter. The letters are interchangeable. Nice to see people in here supporting the business. I'm going to buy something too. Let's browse a bit, shall we? 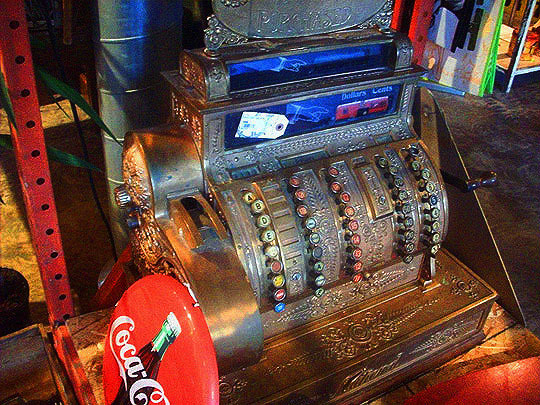 I love old cash registers and this one is one of the best I've ever seen. 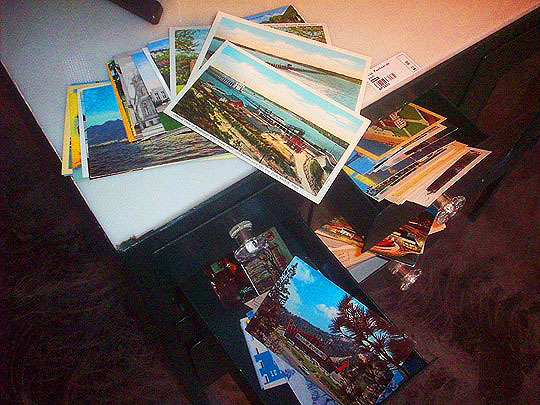 We seem to be on autopilot moving from maps to a box of old license plates. And this Auto gratification trilogy ends with a vintage gas pump. I hate to even think of what the gas prices were when this baby was active! 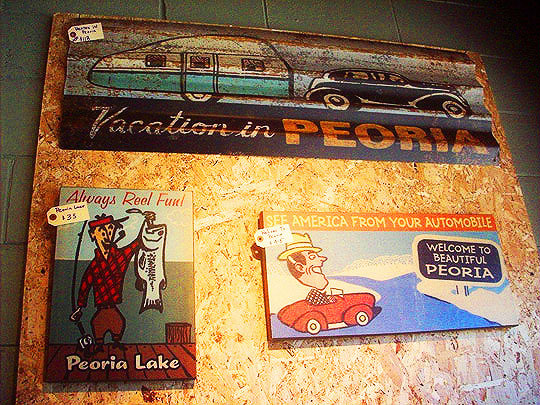 Peoria vacation ads are plastered on this wall. I never knew there was a Peoria Lake. We've seen lots of gumball machines on this blog, but this is the first empty one! "We're having a lovely time, wish you were here!" 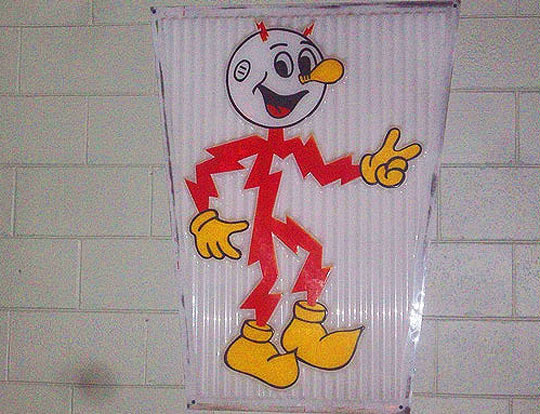 Reddy Kllowatt, I remember this from years ago in Cilco ads, but Jon pointed out that he was a nationwide electricity mascot. 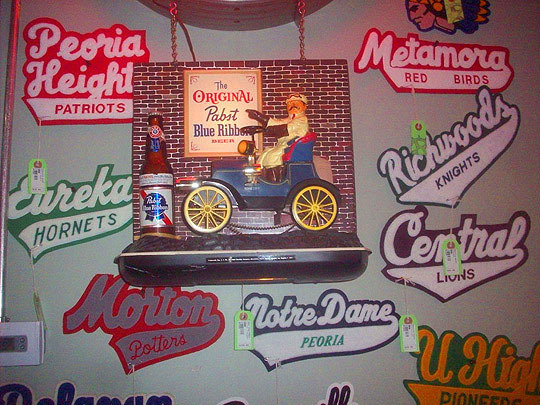 Just about every high school in the area surrounds this vintage Pabst Blue Ribbon sign. While taking this shot of battery powered bartender, an unplanned obligatory mirror shot happened. There's another room over here, let's go check it out. Lots more to look at in here! 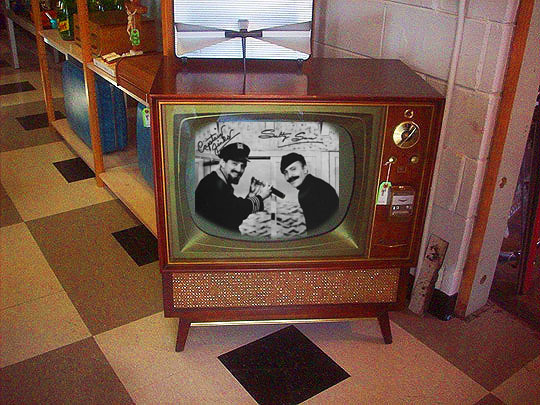 This antique TV is really tuned into the past! I'm trying to figure out what this strange device is. Where do you plug the earphones to it in? Just a reminder that the night belongs to Michelob. Wild In The Streets, I forgot all about that movie and check it out, Richard Pryor was in that, I never knew! I'll have to look for this online. 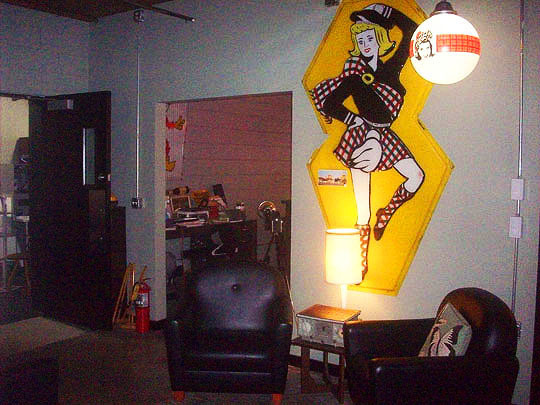 There's a Sandy's break room in the back of the shop. I recently posted a picture of the old Sandy's on Sheridan Road across from Sheridan Village on the MBIP facebook page and so far its gotten over 600 comments! Check it out here. People loved this place! Okay, I think I see what I'm going to buy! I finally scored some swizzle sticks in Peoria. These are Zulu-Lulu swizzle sticks from an era before the words, "Politically Correct" were born. Thanks to Urban Artifacts, my swizzle stick collection continues to grow in Peoria! See yous all tomorrows! Wednesday and Friday—Noon to Five. Further Reading: Peoria Magazines, Peoria Journal Star and facecrack.